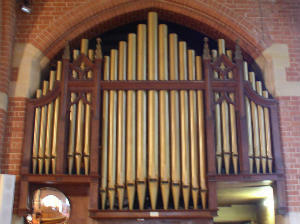 The organ was originally built by Abbot and Smith of Leeds around the end of the 19th century, and was installed in the church second-hand during 1912 and fitted with hand blowing. A major overhaul and installation of electric blowing is documented by J. W. Walker in 1937, with a cleaning in 1954. A further cleaning and tonal improvements by J.W.Walker was carried out in 1967. This involved a new Swell 2ft Fifteenth replacing a tenor C 8ft Voix Celeste of limited usefulness. 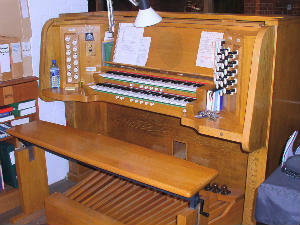 In the late 1970's, the organ suffered badly from sticking sliders and unreliable action, becoming unusable in certain weather conditions (cold and dry). After Diocesan advice and various quotes, Peter Wells Ltd. Organ Builders were awarded the contract. This was carried out in 1981 and comprised a major re-build with a new detached draw stop console with adjustable thumb and toe pistons, some new pipe-work and tonal improvements. Mixtures were added on both Swell and Great, new base pipes were added to the Swell Oboe and made available on the Swell at 16ft and on the Pedal Organ at both 16ft and 4ft pitch, and a most useful new tapered spotted metal Swell 4’ Gemshorn was added. The open Great Wald Flute was stoppered and revoiced as a Gedeckt 8ft and the Swell Trumpet was revoiced. The organ was vastly improved by this work both mechanically and tonally. However, by the early 1990’s the old problems with sticking stop sliders had reappeared, and problems with an inadequate and unsteady wind supply were apparent, together with other more minor problems. After rejecting an ill advised attempt to replace with an electronic organ, F.H. Browne & Sons were commissioned to carry out work in the Autumn of 1994. This included a new more powerful blower, a new Great Flute 4ft stop, new plastic sliders with new electric stop action, a new electric wind chest for the Gt. Open Diapason pipes, revoicing of the Gt Mixture and improved access to the organ. The problems with sticking sliders seem to have been remedied and the organ has proved reliable in use. Five new Swell combination toe pistons were added in 2004 to the console which, and these have proved a useful registration aid. We are fortunate in having this fine pipe organ as part of our musical heritage at the Good Shepherd, and with the necessary care and commitment to maintain its good condition, we can look forward to many more years of good service. Swell to Great Swell Octave Swell to Pedal Swell Sub Octave Great to Pedal Swell Unison Off Gt. & Pd. pistons coupled Swell Tremulant 5 adjustable Gt. & Pd. thumb and toe pistons 5 adjustable Sw thumb and toe pistons Swell to Great thumb and toe pistons Great to Pedal thumb and toe pistons Swell to Pedal thumb and toe pistons, Balanced Swell Pedal, Humidifier.